The capital of Madrid is always buzzing with activity. Owing to its cosmopolitan stature, Madrid is the third largest city in the EU only after London and Berlin! When you are holidaying in Spain, a vacation is incomplete if you do not experience the life of a typical Madrileño. So, we at Talk Travel have compiled a list of places to visit in Madrid. Experience authentic Castilian life, the rush hour of Madrid, great cuisine, brilliant art scene and of course, parties that end when the sun rises. Madrid is infamous for its summer being excruciatingly hot with temperatures hitting 40°C. A lot of residents in Madrid escape the summer heat themselves by vacationing in coastal areas during summer. Spring and fall is the best time to spend in Madrid. The temperatures in this time period range between 15°C to 28°C which makes places to visit in Madrid a total delight! A lot of the popular places to visit in Madrid are concentrated in a small area in the city center. This makes Madrid a great to explore by foot and imbibe more of the city. Otherwise, the public transportation system is good with great connectivity. The metros reach destinations far and wide within the metropolitan area. A ride on the subway is very cheap. The only drawback is that the coaches of the metro are compact and not as wide as modern metros. It is crowded during peak hours of the day, so travel before or after those hours for a comfortable ride. You can find all the information you need regarding public transport here. This huge plaza in the center of Madrid is a typical tourist attraction. There are street performers, living statues, a plethora of vendors selling souvenirs, musicians, countless cafes, and bars in this area. The rectangular plaza is actually a three-storeyed residential building. Be careful of your belongings here as there are high chances of being pickpocketed. Try not looking for ‘authentic’ Spanish cuisine in this area as they will mostly be tourist traps. Just 300 m from Plaza Mayor is another historic plaza called Puerta del Sol. The most famous symbol of Madrid is the El Oso y El Madroño statue. It is a statue of a bear eating fruits from a tree. Apparently, the city once had a lot of bears in the surrounding area many centuries ago. It is best to go in the evenings and observe people as they pass by and the atmosphere is very relaxed. Plaza Callao is a street here famous for shopping. There are a lot of international and boutique shops here for you to shop from. This breathtaking palace used to be the official residence of the Spanish Royal Family once upon a time. Today, the palace is used for state ceremonies, official banquets and more. You can appreciate great architecture, the large courtyard behind tall iron railings. When you here, you can see the banquet halls, the kitchen, royal pharmacy and do not miss out on the royal armory. Get down at the Ópera metro station. Head outside and follow the road signs to walk towards this grand palace. Entry to the Palace costs €10 without the guide and €14 with the guide. Try visiting this place in the afternoon or early evening. The place lights up in sunset orange as the sun sets and the place has a different aura to it. As you finish visiting the Palacio Real de Madrid, walk for 1 km next to the Palace and turn left Calle San Quintin. Follow the signboards for a slice of Egyptian history in the midst of a bustling Spanish city. This Egyptian temple was initially built in 2nd century BC, 15 km south of Aswan in the south of Egypt. When the Aswan dam was constructed in 1960, owing to rising water levels there was a threat to this temple and other monuments around the river. When UNESCO made an international appeal, Spain came forward to save this historic temple. It is considered one of the few works of Egyptian architecture found outside Egypt. The entry to this place is free. The whole place has a distinct charm to it unlike any other, may be owing to its unique history. The best part about this landmark is the view of the sunset here. Check the sunset timings in Madrid before heading here as timings vary depending on the seasons. The silhouette of the Palacio Real de Madrid on the left as the bright orange orb sets into the horizon is a spectacular scene to behold. This huge 19th-century park is famous for its lake and the rose gardens. Not only that, there are elegant sculptures, monuments, galleries, and a perfect place for a quiet time in the city. Take a stroll in the expansive garden and then go boating in the lake. What is distinct about this place is the semicircular colonnade and the statue of the monarch mounted on a horse on top of it at the center. All within a walking distance of less than 3 km in total are three important art museums of Madrid. This is one of the most important places to visit in Madrid. This showcases the love for art the Spanish have. This Spanish national art museum houses some of the best and finest art pieces dating from the 12th to the 20th centuries. The cost of entry is €15 with guided tours costing more. It is best to buy the ticket in advance to avoid waiting in queues. To travelers’ benefit and surprise, you can access this amazing museum from Tuesday to Sunday from 6 pm to 8 pm, or Sundays from 5 pm to 8 pm for FREE! There is obviously a long queue waiting to enter at this time but its ok as you will get to experience something so beautiful for free especially if you are backpacking in Spain. This museum is just 1 km away from Museo Nacional del Prado. There are masterpieces from Pablo Picasso, Joan Miró and Salvador Dalí here. 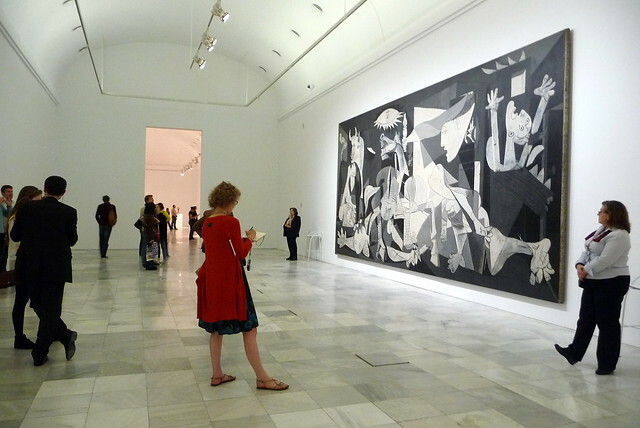 It is famous for Picasso’s famous Guernica painting here. The Reina Sofia Museum is considered the world’s largest museums for modern and contemporary art. The tickets cost € 8 if bought online and € 10 if you buy them in person at the entrance of the museum. You can visit this museum for free from Monday to Friday from 7 pm to 9 pm, Saturday from 2.30 pm to 9 pm, or Sunday from 10 am to 2.30 pm. It is the largest private collection of European art. This collection was started in 1920 by Heinrich Thyssen, a German entrepreneur. The entry fee costs € 12 and it is worth the time to be spent here as it houses some fine art from all across Europe. Unique with marble sculptures and fountains, this famous square is called Plaza de Cibeles. This is an upscale shopping street in Madrid and famous for its nightlife. Take a stroll down this iconic stretch of road and visit an opera house or a theater to catch a performance. 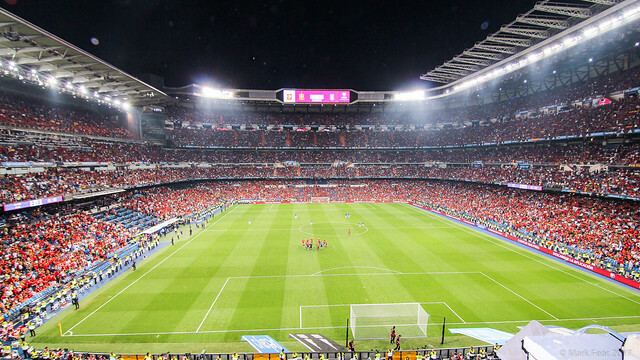 Visit the home of Real Madrid FC and the gigantic Santiago Bernabéu Stadium. Catch an important match if possible. The experience of watching a football match live is an unforgettable experience. If you are an animal lover, it is best to skip this activity altogether. Bullfighting is deeply ingrained in Spanish culture. The largest bullring (called plaza de toros in Spanish) called Las Ventas is in Madrid. The bullfighting season is between March and October every year. Depending on the seating area, the price of the ticket varies anywhere between a few euros to over € 100. Madrid is colloquially famous for being called as the city that never sleeps. Pubs, bars, discos, and clubs are well open until the wee hours of the next day. There are thousands of people dancing the night away at parties. Popular places in Madrid are Huertas, Salamanca, La Latina, Gran Via, and more. Here is a list of nightclubs that you cannot miss while you are here. Go to a tapas bar like a local and have a refreshing beer with free tapas. Tapas are appetizers to accompany your drink in Spain. You should try the local pork specialties such as chorizo, morcilla, oreja in a typical tavern. Cheese (manchego) is also a good recommendation. Do not visit bars at popular tourist attractions as they are crowded and the service could be bad. Go for those that are frequented by locals. You might be excited to eat paella in Madrid. There are a few restaurants which offer this great dish but look for them in advance and do not get carried away by people inviting you to their restaurants. Have a look at these detailed guides – Part 1, Part 2, and Part 3 to Spanish cuisine so that you know what to order at a restaurant. Among the places to visit in Madrid, there are a lot of pretty towns just outside the city. 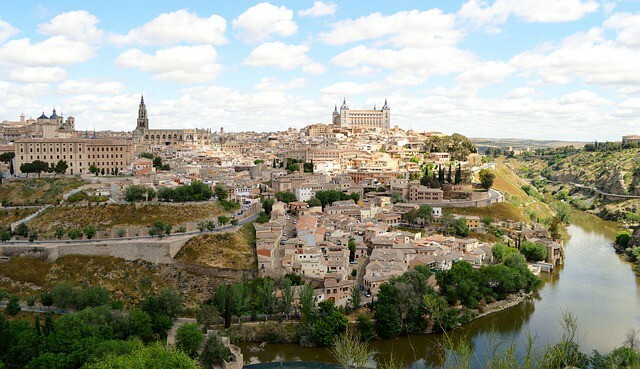 You can visit Segovia, Escorial, Avila, Aranjuez, Alcalá de Henares, and Toledo. Each of this place has a lot of history and the best place to catch up on some authentic local life and food. When you are in Madrid, try to visit Barcelona, Valencia, Seville, Granada, Basque country, and the Balearics. We hope this guide provided you with all the basic information needed for a great time in Madrid. 13 things to do in Menorca to feel like a Menorquíno!